CHAMPAGNE LADY’s Capt. 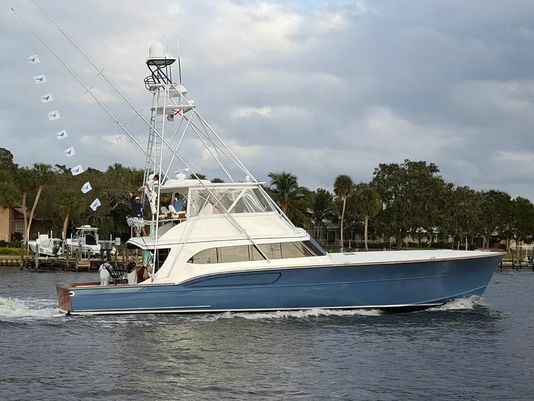 Josh Chaney, in his first big tournament victory as a skipper, led Tony Ingram, Carl Repetto, Rob Miller and Mark Donohue, and crewmen Connor Tillman, Mark McDevitt and Sean Young, to nine sailfish releases Sunday and 20 releases during the tournament to win the 2016 Pirates Cove Resort and Marina Sailfish Classic in Stuart, FL. CHAMPAGNE LADY is the Paul Mann 68′ formerly known as JICHI, and is already doing the new owner, captain and team proud! Overall, the fleet of 24 boats enjoyed three days of good sailfish action topped off with 76 sailfish on Sunday to give the 28th annual event a total of 222 sailfish caught and released. Team LISA K aboard a Paul Mann 67′ also enjoyed a good tournament with nine sails during the tournament. “We went to a spot we’ve been fishing all week where we knew there would be sails,” said Chaney, “There was a lot of bait there, and lots of sails, and we ended up catching them.” Big congratulations, a proud shout out and a huge welcome to the Paul Mann family to team CHAMPAGNE LADY with this exciting win! !